On October 19, 1781, General George Washington had one of the ultimate highs in his military career. With the help of the French army and navy, Washington forced the surrender of British Lord Charles Cornwallis’ forces at Yorktown, Virginia. But, weeks before North learned of the calamity in the Tidewater of Virginia, Washington dealt with his own calamity. One very personal. The death of his stepson. 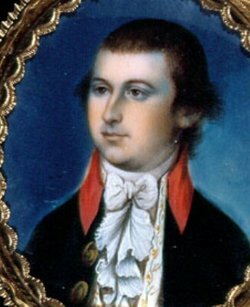 John Parke Custis, affectionately known as “Jackie” or “Jack” as he got older, was one of two children that Martha Custis Washington brought into the marriage with George Washington on January 6, 1759. The other child, Martha Park Custis, known as “Patsy” had died in 1773 of an epileptic seizure. Now, seventeen days after the successful completion of the Siege of Yorktown, Jack Custis would be dead. Custis had joined his stepfather as a volunteer aide-de-camp for the Yorktown Campaign and contracted “camp fever” a catch-all term for a whole litany of illnesses. With the disease quickly causing his health to fail, Custis had one last wish before leaving the lines at Yorktown. He wanted to see the surrender, so faithful attendants lifted Custis in a stretcher to the top of one of the redoubts. From there Custis had a complete view of the proceedings, the crowning achievement of his stepfather. To remove him from the scene of pestilence and in a hopeful attempt to save 26-years old life, Custis was moved 30 miles up the Tidewater Peninsula of Virginia to Eltham Landing, where his uncle, Burwell Bassett owned a plantation. His mother, Martha and wife, Eleanor Calvert Custis was summoned to his bedside. Jack was buried in the family plot near Williamsburg, Virginia at Queen’s Creek. The funeral was a week later and afterward Washington accompanied Martha and Eleanor back to Mount Vernon. George and Martha Washington would spend considerable energy in the pursuing years raising their late son/stepson’s children. Jack’s widow, Eleanor, would leave the two youngest children in the care of the Washington’s and by war’s end had remarried to a Dr. David Stewart of Alexandria in which the couple would have 16 more children. But, all that was in the future. In the meantime, after leaving Mount Vernon in mid-November, George Washington had a revolution to see through to its successful conclusion. The loss of his stepson, whose limited service in the war does not diminish the anguish felt by his family, put Washington in the company of countless parents whose sons had given their lives in the same cause. And the war had approximately two years left in America. This entry was posted in Revolutionary War, Uncategorized and tagged Battle of Yorktown, Colonial Williamsburg, Continental Army, Eleanor Calvert Custis, French Army, French Navy, George Washington, Jack Parke Custis, Jackie Parke Custis, Lord Charles Cornwallis, Martha Washington, Mount Vernon, ron chernow, Siege of Yorktown, Williamsburg. Bookmark the permalink.